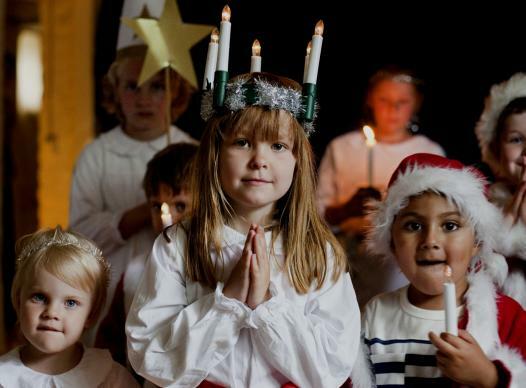 Around Christmas time in Sweden, one of the biggest celebrations is St. Lucia’s Day celebrated by a girl dressing in a white dress with a red sash round her waist and a crown of candles on her head. Will Santa be wiggling down your chimney, or using his magic key to get into your home on Christmas Eve? Is he a distant relative of St. Nicholas, a generous saint/monk/bishop who secretly threw gold coins through people’s windows? Or a jolly red-clad Santa with a belly that shakes like a bowl full of jelly? Wait, is there a Santa Claus? Kids have been asking parents that question for a long time. Eight-year-old Virginia O’Hanlon asked and her father told her to write to the editor of New York’s Sun in 1897. “He lives, and he lives forever,” wrote Francis Pharcellus Church in what became history’s most reprinted newspaper editorial. All the twinkling lights and wrapped gifts, movies and television specials — not to mention the Santas on every corner — can turn a kid’s head. It is an emotional and spiritual tightrope that many families walk between letting their children have a magical Christmas and making sure they know that Jesus is the reason for Christmas. Despite the best of intentions, there always comes that time when a child asks and the adults have to fess up. We all dread the tears and disappointment but kids can surprise us. Jessica Brodie, editor of the United Methodist South Carolina Advocate, and her husband, Matt, have four children, ages 7, 8, 9 and 11. 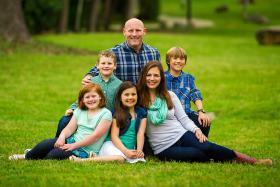 “We tell the kids that Santa is Jesus’ friend and loves to help people around the world celebrate Jesus’ birthday. That’s why he goes above and beyond to deliver gifts to everyone who asks for gifts from Santa each Christmas,” Brodie said. This was the year her oldest, Cameron, challenged his mother. The kids in his class told him that Santa is really your parents. He asked his mom about that. “I just want to know the truth,” Cameron said. "Well, sweetie, I think Santa is awesome, and he makes Christmas and celebrating Jesus' birthday so much more fun, and when we believe in Santa, we get gifts from Santa," his wise mother said. “He looked at me a long moment, then smiled and nodded, and said, ‘Ahhhhhhh. Gotcha. OK.’ Then he winked at me and said, ‘Don't worry. I won't tell the other kids.’ He's been going along with everything just like normal ever since,” she reports. Chris Fenoglio, manager of web content for United Methodist Communications, and his wife, Linda, decided to be prepared for that question and the story has since been turned into a Christmas poem published by Stopher Publishing and available on Amazon. When his oldest child was 9, the Fenoglios gave her a special gift. Inside an antique box, wrapped in purple cloth, was a hand mirror. As she held it up and saw her reflection, her parents told her, “Kristin, you are Santa Claus.” They went on to explain that Santa was alive in every person of good will. The Rev. Michael Williams, pastor of West End United Methodist Church in Nashville, Tennessee, doesn’t remember either of his two girls really questioning or being disappointed in whether Santa exists or not. After all, Santa always ate all the cookies, wrote a Thank You note, and the deer chewed up the carrots -- which they left evidence of on the patio. Williams, who is a well-known storyteller, wonders what is wrong with a story about a person who gives gifts to everyone? It is a lesson in grace, he said. The Rev. Joe Iovino, who writes for UMC.org at United Methodist Communications, agrees with Williams. 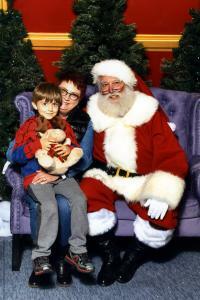 Brodie said she always worried kids might get confused about what was real (Jesus) and what was myth (Santa). For that reason, they make sure the holiday is Jesus-centered. On Christmas morning, all six members of the Brodie family will run downstairs and see a tree filled with presents from people who love them, including Santa Claus. But, before the gifts are unwrapped, the family will sing happy birthday to Jesus and blow out a candle on a warm plate of cinnamon rolls.